Differences have the power to either divide or unite people. For some those differences produce greater understanding and appreciation. In others those differences lead to fear and hate. And too often fear and hate prevents us from moving forward and we’re unable to work together to solve the problems plaguing our society. On Thursday, Nov. 4 I attended a lecture and interfaith panel discussion on the book “American Grace: How Religion Divides and Unites Us.” The event was sponsored by Wheat Ridge Ministries, an organization that provides support for new faith-based health and human care organizations and programs. “American Grace,” the latest work of Dr. Robert Putnam, professor of public policy at Harvard University, examines the ways the nation’s religious landscape has changed over the years, how those changes have impacted society and how people view religions other than their own. Dr. Putnam talks about his book "American Grace: How Religion Divides and Unites Us"
In 2006 Dr. Putnam surveyed 3,000 people from congregations across the country and found, among many other things, that Americans feel warmest toward Jews, Protestants and Catholics and coldest toward Muslims. Dr. Putnam noted that people feel most uncomfortable about religions they know the least about. That sad truth was one of the motivations behind a major JCUA program. After the 9/11 terrorist attacks there was an increase in intolerance and hate crimes against Muslims. In response to this, JCUA established the Jewish-Muslim Community Building Initiative (JMCBI). With everything from an interfaith celebration of Ramadan to discussions over coffee, JMCBI is actively working to break down walls and build bridges between Muslims and Jews. 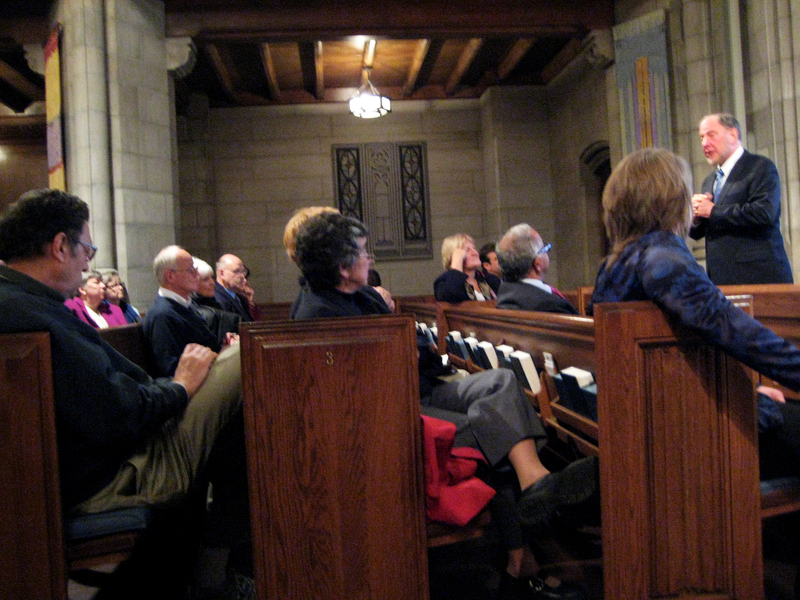 After the lecture several leaders from faith-based groups in Chicago took part in a panel discussion to talk about some of the areas Dr. Putnam illuminated. 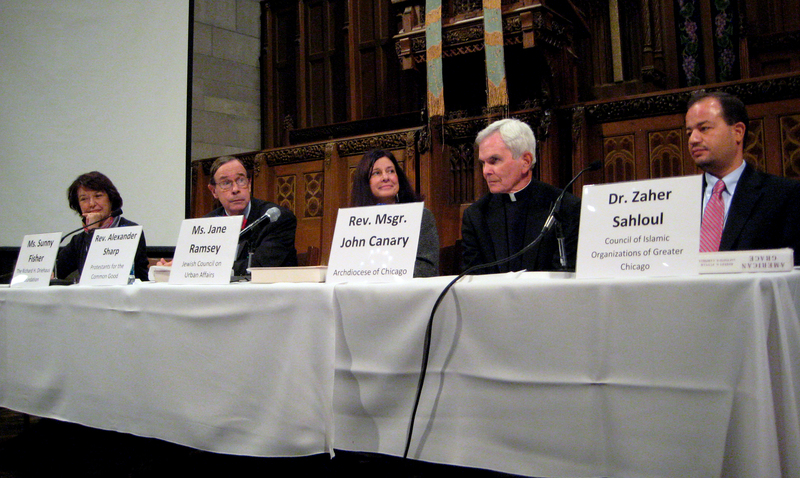 On the panel were Jane Ramsey, executive director of JCUA; Dr. Zaher Sahloul, executive committee chairman of the Council of Islamic Organizations of Greater Chicago (CIOGC); Sunny Fischer, executive director of The Richard Driehaus Foundation; Alexander Sharp, executive director of Protestants for the Common Good; and John Canary, vicar general of the Archdiocese of Chicago. A common thread arose during the discussion that working on social justice issues can produce unity amongst people of different faiths. And, said Ramsey from JCUA, what we learn in our faith communities can be key to moving forward and working together. “The challenge is in the inward versus the outward—how we take lessons of loving and caring that we learn in a community—in a church, a synagogue, a mosque—to powerful places of engaging,” said Ramsey. “It begins with listening to one another outside into our broader communities and caring about the issues,” she said. And how sweet is the product of collaboration when compared to the destruction produced by fear and hate. This entry was posted on Tuesday, November 9th, 2010 at 5:32 pm and is filed under Community Events. You can follow any responses to this entry through the RSS 2.0 feed. You can leave a response, or trackback from your own site.